Williams Shift’s debut album We Were Wonderers is released digitally and on cd today! Williams Shift is a new project from Matthew Stone (Soporus, Saxon Shore) and Stephen Roessner (Saxon Shore, Small Signals). We Were Wonderers was recorded in various home studios, produced and mixed by Grammy award winning producer Roessner in conjunction with Stone, and features the vocalist Jill Purdy. Williams Shift comes to life as an outgrowth of the poppiest elements incorporated in songs recorded as members of the instrumental band Saxon Shore combined with the concept of the “Williams Shift” where defenders would align themselves to better field naturally pulled hits from Boston slugger Ted Williams. The band blends soaring synth pop influences with an ever-expanding and spiraling Williams mythology and weight of the Cosmos. Captivated by theories of human cryonic suspension and the cagey details post-Williams mortem, the band embraces an actively dreaming suspended head and an alternate future of Williams’ awakening. His frozen head orbits the earth on a satellite with other cryonically frozen beings, a tragic Greek chorus echoing Williams’ thoughts through Brian Wilson-esque (musician, not reliever) melodies. This is an ode to melody, love lost, remembrance, baseball, Ted Williams’ legacy, and the universe with a hefty dose of artistic license and imagination and the resulting existential and philosophical ramifications. Williams Shift has been a long dream for Matthew Stone even while he was touring with Saxon Shore. The instrumental track “Dock Ellis Spirit Animal” represents a touchstone and transitional point from his work as guitarist in Saxon Shore and the more pop elements captured in We Were Wonderers. A track like “Sustained Combustion” from Saxon Shore’s It Doesn’t Matter was a Stone-penned melody initially conceived as a proto-Williams Shift track. On “Dock Ellis,” Stone’s instrumental pop melody continues on that spectrum with Stephen Roessner’s production mixing in various guitar arrangements to heighten the pure pop energy. Thematically, Dock Ellis’ LSD-fueled no-hitter story ranks high in the canon of crazy baseball stories and links back to some of the Ted Williams inspired baseball themes on the album. “The Heads And The Bodies” is an energetic track that bridges Matthew Stone & Stephen Roessner‘s previous instrumental work with Saxon Shore and develops that post-rock influenced soundscape to layer vocals, synths, shoegaze guitars, and strings. Shimmering female vocals, provided by vocalist Jill Purdy, were an essential requirement to Stone’s idea for Williams Shift and serve to balance Stone’s vocals. It borrows a bit of sunshine in the form of vocal harmonies, linking to the summery scene of Ted Williams remembering his last at bat in Boston. Roessner’s masterful drumming and production add the final glue which holds the palpable sonic landscape together. Lyrically, the track introduces the apocryphal story of Williams’ cryonically frozen head. When blood was exchanged for the cryonic fluids, his severed head was placed on a small metal tuna can to prevent it from being frozen to the case where it was stored. Ultimately, the can froze to the head and proved difficult to remove. An opportunistic worker in the facility used a wrench to knock the tuna can off, missing the can on the first strike, and instead bashing the frozen head of Mr. Williams. We Were Wonderers’ artwork was based upon the frozen head story. 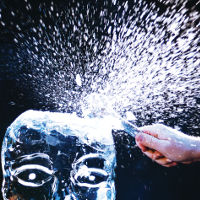 An ice sculpture head was commissioned and high-speed still and video cameras were positioned by Philadelphia photographer/director Timothy Stevens to capture Stone chipping away at the ice head with a wrench. The still images were processed to capture the cover and insert art and the video was used as a preview video announcing the album. We Were Wonderers was predominantly conceived as a studio side-project, but Stone and Roessner have assembled a live band that is currently practicing and preparing Williams Shift tracks for live shows later in 2015. We Were Wonderers is available on both cd and 2xLP. The 2xLP features a 4th side etching from John Ringhofer (Half-handed Cloud) representing some of the album’s thematic elements. The vinyl is pressed on blue vinyl with white marble veins and white vinyl with blue marble veins and presented in a gatefold jacket. Additionally, there is a limited edition cassette featuring the instrumental version of We Were Wonderers and released in conjunction with our good friends at Flannelgraph Records in Bloomington, IN. Stream We Were Wonderers through the embedded bandcamp link below, order the digital release through the band, order the 2xLP /cassette package, the 2xLP, or cd of We Were Wonderers from btv, and order the We Were Wonderers Instrumentals cassette from our good friends at Flannelgraph Records in Bloomington, IN or directly from btv. Byul.org makes experimental ambient and electronic music with catchy pop hooks and lyrics sung in or processed from their native Korean. Byul.org is a collective of artists, graphic designers, fashion designers, and musicians who claim they are poets and drinkers. They also claim that they will do anything but murder for cash. It’s sort of difficult to say what they are; they’re not really a band, they’re not really a magazine, and their CDs have never really been released as official albums, but as supplements to their magazine/art book publication Monthly Vampire. Not to mention that the Monthly Vampire isn’t even really monthly at all… We guess that’s why they stick to the expression ‘drinkers’ to describe themselves. Who cares, anyway, they’ve been the coolest guys around the Seoul underground for ten years now, or at least they’ve pretended to be, hosting various events and performances to showcase their live performances.Burnt Toast Vinyl first learned of the South Korean band Byul.org through their contribution to the elegant, but overlooked 2001 film Take Care of My Cat. It was released in the US in late 2002 and on DVD during 2003. Matthew Stone (Soporus, Saxon Shore) saw the film and made sure to pay attention during the credits to find out who was on the soundtrack. For nearly two years, Stone began to track down everything he could find from the band through file sharing outlets since their material had never been released in the US and only rarely released in their native South Korea. After finding a few tracks from a kindly Korean over Limewire, Byul, as they were initially called and means Star in Korean, became the subject of legend and lore in the btv camp. Over drinks, we would often wonder about the band and if we could ever meet them or do a release. Then, in 2005, we discovered the newly created Byul.org website. The band renamed to put distance between themselves and a K-pop star and started to put out information about their music and releases. We were in contact as soon as we found the site and began to discuss collaborating. Soon, large parcels of releases were exchanged. It turns out that there are several Monthly Vampire releases that are the creative outlet for Byul.org, a truly artistic and music organization. We all felt that we were on the same wavelength and planned out a future release. The initial plan was to make an LP for Europe and the U.S. The problem was finding the time to make a proper album that felt right and represented Byul.org. As additional magazine publications and Byul.org tracks were released during the five years that passed, the album was always part of the plan. Now, Burnt Toast Vinyl, Byul.org, and Club Bidanbaem decided to make Secret Stories Heard From A Girl In An Opium Den the first official album internationally and domestically. The tracks were selected from the compact discs supplemented in the irregular publication ‘Monthly Vampire, A Magazine’ (which is not really monthly at all) and from various EPs. The double-jacketed LP has 14 tracks on it, including the track ‘A Promise’, which is not included with the CD. The CD is a single audio disc with 14 tracks on it, including the track ‘Idiots’, which is not on the LP. Byul.org began as a loose group of friends who occasionally had drinking sessions together. They were young and foolish back then, which made them brave. Out of nowhere they started drawing sketches for a magazine, in which they put in rough records of our friends. In turn, the magazine helped them find even more friends. Secret Stories Heard From A Girl In An Opium Den is a collection of stories and sounds from such activities. And Byul.org are still making things together with old and new friends as foolish drinking buddies.